The yardstick saw its shadow - and Winter returned just in time for the new year. 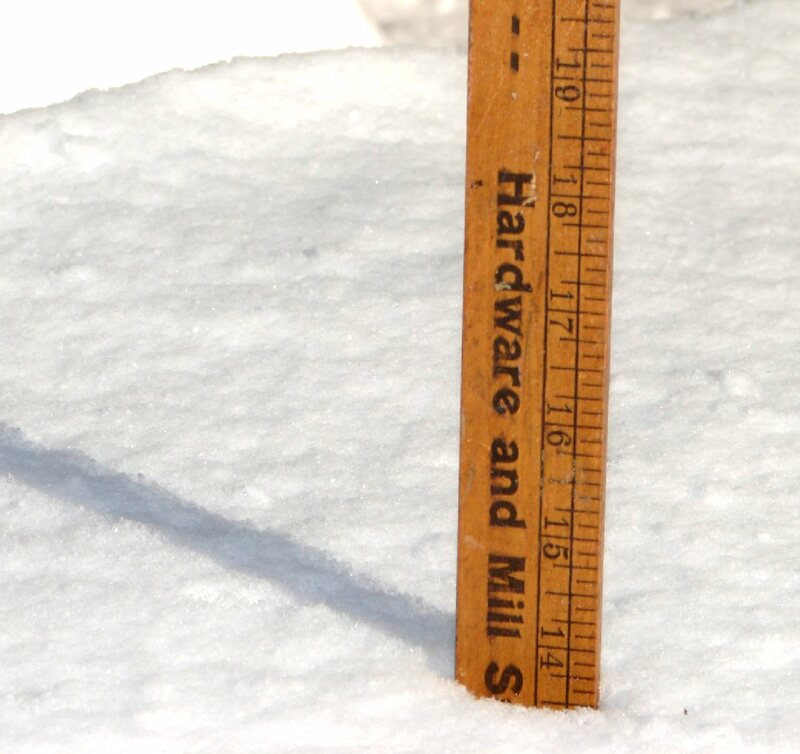 The yardstick saw its shadow – and Winter returned just in time for the new year. In early December, Assemblyman Will Barclay presented Beacon Hotel owners and Oswego residents Atom and Falecia Avery with a state resolution, congratulating them on receiving the 2014 Small Business Excellence Award. The couple founded the 14-room hotel in 2011 after completing extensive renovations. “Local, small business is a large part of our economy. I’m proud that our very own Beacon Hotel has been recognized. Businesses like the Beacon Hotel are the backbone of our economy and should be supported by the local community,” said Barclay. The hotel, located in Oswego’s Historic Franklin Square District, pays tribute to Oswego’s rich history. The Small Business Excellence Award showcases those local businesses of Upstate New York. The U. S. Small Business Administration and the New York Business Development Corporation, along with area lenders and economic development organizations make selections for the excellence award. According to the New York State Small Business Development Center, there are more than 2 million small businesses in New York. Thousands of Oswego County youth will continue to have access to books over the summer and avoid the summer setback in their learning, thanks to the generous support of the Tarandi Foundation. The Tarandi Foundation recently donated $25,000 to support the Oswego Bookmobile, which currently distributes approximately 5,000 books to 2,000 children in Oswego every summer. The Oswego College Foundation Inc., at SUNY Oswego will manage the distribution of the funds to the bookmobile. Bookmobile steering committee members said they hope to put the latest gift toward the purchase of a new bookmobile, which is estimated to cost approximately $170,000. Promoting early literacy is one of the Tarandi Foundation’s major interests, according to Neelesh Shah, whose parents, the late Ravindra and Manjula Shah, established the foundation. The afternoon demonstration involving more than a hundred members of the college community, including students, faculty and staff, took place in conjunction with similar expressions across the country following decisions not to indict police officers in the deaths of black men in New York, Missouri and elsewhere. The Oswego County Legislature, after some lengthy debates, approved the 2015 spending plan. The legislators whittled some more off the tentative $54,479, 777 budget before it was passed 17-7-1 along party lines. The legislature’s seven Democrats were in opposition and Legislator John Martino was excused. The tax levy was lowered to $53.8 million, and the increase dipped to 1.15 percent. The generic average tax rate fell from $7.59 per thousand of assessed value to $7.49. However, “It’s a very fragile budget,” according to Legislator Mike Kunzwiler, minority leader. Legislature Chairman Kevin Gardner praised the hard work on the budget done by the department heads and legislators. It’s been about 10 years since the county has had to increase taxes, he noted. The Physical Services Committee recommended giving people a reason to be freezing next March. And, it’s all for a good cause. Michael Smith, DPW commissioner, received a request from the Special Olympics Committee, to host the “Oswego Polar Plunge” for Special Olympics New York. The date of the event is Saturday, March 29, 2015, and will be held at Oswego Wright’s Landing Marina, according to Cassandra Rucker, director of development for Special Olympics New York. She requested use of the launch ramp at the Wright’s Landing Marina, just as they had this past spring. The 2014 event was the coldest and fastest Polar Plunge for Special Olympics New York with temperatures below freezing and windchill even lower. Still, more than 125 people from all around the area, including SUNY Oswego, took part in the second Oswego Polar Plunge for Special Olympics New York. “In sticking with tradition, that began when I was elected on the council, I would like to amend this resolution,” Council Vice President Eric VanBuren said. He proposed including in the resolution that First Ward Councilor Fran Enwright and Fifth Ward Councilor Bill Barlow would represent the city by taking the Polar Plunge in 2015. The full council approved the resolution on Dec. 8. State Senator Patty Ritchie on Dec. 18 announced that the Governor signed into law her bill to help speed the discovery of potentially life-saving vaccines for deadly diseases including Eastern Equine Encephalitis, the mosquito-borne virus that’s claimed five lives in Oswego County and Central New York. The measure (S.2115), which passed both houses of the Legislature with overwhelming bipartisan support, creates a new “21st Century Workgroup for Disease Elimination and Reduction” within the state Department of Health. Comprising experts in diseases, infection and public health, the group is tasked with identifying obstacles that may be preventing development of effective vaccines for EEE and other diseases, including West Nile Virus, Lyme disease, tuberculosis and more. Since the death of Oswego County’s 4-year old Maggie Sue Wilcox from the EEE virus in 2011, Senator Ritchie has vowed to help find a vaccine to prevent the disease, and has also taken other steps to protect Central New Yorkers’ health. Maggie Sue’s family praised the signing of this landmark legislation. With 100 years of serving the Oswego County community, The Greater Oswego Fulton Chamber of Commerce announced Danielle Hayden of Oswego has been selected as the assistant director of the organization. In her new leadership position, Hayden will be tasked with executing the chamber’s renewed focus to provide services to members. Under the leadership of the executive director of the chamber, Greg Mills, Hayden will specifically focus on improving membership benefits and emphasizing the importance of a strong working relationship between members and the organization through increased communication and transparency. “We are very excited to have Danielle back at the Greater Oswego-Fulton Chamber of Commerce. Her previous experience is a tremendous asset as we move forward building the chamber and expanding our services to our membership and the community,” said Mills. The Oswego County Corps of The Salvation Army was facing an unprecedented challenge. Reports indicated that contributions to the red kettles were running behind last year and well short of the 2014 goal of $106,000. “We are in need of volunteers to man the kettles and ring the bells. Some key locations may have to be left unmanned at times because we don’t have the people to cover them. That means the funds that could be raised at those locations won’t be raised. And that could mean we won’t reach our goal,” said Major James Purvis, executive director. The Salvation Army’s Online Red Kettle is ready to receive your donation. Log into www.OnlineRedKettle.org, click on “Find a Kettle” and find “Team Oswego County.” Make your donation; all gifts come directly to the Oswego County Salvation Army. The Army served 400 families this Christmas season. Anyone wanting more information or to offer service as a volunteer may call the numbers above or 207-3359 or stop at the office at 73 W. Second St., Oswego. A new feature on the Oswego County government website allows people to see the results of restaurant inspections conducted by the Health Department. The database includes restaurants, bars, day care centers, schools, colleges, and senior nutrition sites. The database does not include mobile vendors or temporary food service establishments. The data includes the name and location of food service establishments and the violations that were found at the time of their last inspection. A new state law which prohibits consumers from placing unwanted computers, televisions and other electronic equipment in the trash will take effect Jan. 1. In Oswego County, residents can continue to bring unwanted electronic waste items to the Oswego County Solid Waste transfer stations and recycling drop-off centers. The new state law prohibits consumers from placing items in the trash or at the curbside for trash pickup. Manufacturers are required to recycle certain types of electronic waste for consumers. After a late-December return of Indian Summer, the weather chilled out — after we enjoyed our first green Christmas since 2011 and fifth since 2001. It was breezy and very mild Christmas Eve with “lows” climbing to near 60 degrees. Temperatures for Christmas Day started near 60 and fell during the day. By “white,” Gregway means there is at least one inch of snow on the ground. So, a week after Christmas, Old Man Winter returned with a vengeance to ensure we at least “enjoy” a white New Year’s Eve.